Congratulations! You made it! You’ve been accepted to law school, and are getting ready to embark upon a successful legal career. Would you like some tips to help you get the most out of your law school experience? If you asked any lawyer, “If you could go back to law school, would you do anything differently the second time around?” the answer would be a resounding, “YES!” If we could travel back in time, knowing what we know now and re-do law school, every lawyer would do things differently. It’s been more than a decade since I graduated from law school. Since I graduated, I’ve worked on thousands of cases, spent thousands of hours in the courtroom, and have served at the lead trial lawyer in about 200+ jury trials. If I could go back to law school and do it all over again, I would do things very differently. But since that’s impossible, at least let me help you get the most out of your law school experience. The relationships you’ll develop are more important than your class rank. Ten years later, I have no idea where I ranked in class (obviously, I wasn’t #1). But… I don’t remember who was in the top 10% of my class, either. I remember who I trusted, I remember who was a good friend, and I remember who I could call for help. Take time to develop strong relationships while you’re here. Some of your friends will become future leaders of the Bar. Some of them will become future leaders of your city, your county, or your state. Some of them will even go on to national prominence. You can always go back and re-read a case, re-read a hornbook, or research something you missed in class. You can’t go back and re-develop relationships that you missed out on. Take trial advocacy and a clinic program. You may not plan to ever walk into a courtroom, but take the class anyway. The lessons you’ll learn will help you in the boardroom, during client meetings, and anywhere else that you need to persuade someone to your point of view. Spend a summer studying abroad. This may be the last chance you’re going to have for a very long time. Once you start working, it’s not very easy to sneak away for an entire summer. Do it now, while you’ve got the chance. Develop your memory. The better you’re able to recall specific facts, principles, and citations, the better you’ll do on exams. Investing in a good memory development program can be one of the best investments you’ll ever make. Some recommendations include Harry Lorayne’s Memory Book, Kevin Trudeau’s Mega Memory, and Ron White’s Memory in a Month. Cancel your Facebook/Instagram/etc page. Or at least set it to “Private.” Yeah, these places are great for keeping in touch with friends, but you don’t want the hiring partner seeing those pictures of you doing kegstands and talking about how drunk you were last weekend, do you? Don’t let your non-lawyer friends fade away. For the next 3 years, you’re going to be surrounded by law students and law professors. For the rest of your life, you’re going to be working with lawyers. Don’t let your non-lawyer friends and acquaintances fade out of your life. They friends may not understand what you’re going through right now, but they’ll remind you that there’s more to life than briefing cases. You WILL say something stupid during class — it’s not the end of the world. Many law students are afraid to speak up in class because they’re afraid of being wrong or they’re afraid of looking stupid. That fear keeps them from participating in class, depriving themselves of one of the most important parts of their legal education. Let’s set the record straight: you will say something stupid in class, and the professor will probably make you feel dumb. If you were right 100% of the time, you’d be teaching the class rather than taking it (or managing a hedge fund.) Get over it and participate anyway — your ego will survive. Don’t be “that” guy. They say that in poker, if you can’t spot the sucker within the first 30 minutes — it’s you. In law school, if you can’t spot the gunner who always volunteers, talks too much, and brags about how smart he is — it’s you. The reputation you’re developing now will follow you throughout your entire legal career. What type of reputation will you develop? Grades may (or may not) matter. You got into law school because you’ve always been in the top 10%. So was everyone else in your class. But soon, 90% of your class will come to the sad realization that they’re no longer in the top 10%. Does it matter? Well, yes and no. If you want to work for a top tier law firm, then yes, it matters, because many of them will make hiring decisions based on your class rank. If that’s where you want to work, then you need to bust your hump and get in the top 10%. If you’re not going to be in the top 10%, then you need to decide whether grades matter to you, or whether there are better ways to spend your time. There’s a certain amount of truth to that old adage about the difference between the “A,” “B,” and “C” students. There are lots of students who could spend more time in the library and move their grades from “C’s” to “B’s,” but is the payoff worth it? 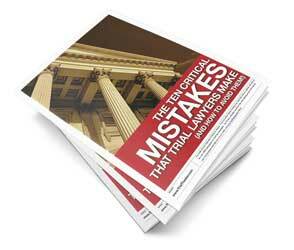 Are there better learning opportunities available besides what you’ll learn in the law books? For example, I know I could have improved my GPA by spending more time in the library. But I didn’t want to work for a big firm — I wanted to be in the courtroom. So, instead of investing extra hours at the library, I invested extra hours at the Purple Porpoise bar across from the football stadium, striking up conversations with anyone and everyone I could meet. That didn’t help me during final exams, but today, there isn’t a juror in the courthouse that I can’t talk to. That’s been far more valuable for me than a “B+” would have been. Take advantage of student discounts and go to conferences. All of the major legal associations host annual conventions and specialized CLE conferences. Some of these programs are amazing. You’ll learn from the best practitioners in the field, discover what the practice of law is really like, and schmooze with experienced lawyers and judges who are more than happy to talk with you and offer their guidance and support. Here’s the best part — most of these groups offer discounts for law students! Take advantage of the opportunity and attend at least one major conference a year. It may lead to a job opportunity, a mentor, or, maybe you’ll realize, “I do not want to go into that field of law!” No matter what happens, it will be money well spent. Wherever you are, be there. If you’re in class, pay attention. Sometimes it gets boring and your mind starts to drift, but snap back to attention and focus on the class discussion. That sounds simplistic and stupid, but it can mean the difference between success and failure. Unfortunately, many students will ignore this advice. If you sit in the back of the classroom, you’ll see them surfing the web or playing solitaire. Their bodies are in class, but their minds are elsewhere. These are the same students who will think about law school when they’re supposed to be relaxing at the beach or spending time with their significant other. Don’t fall into the same trap. Wherever you are, be there. Compartmentalize what you can. When you’re in class, focus on class. When you’re having fun, don’t let thoughts of class or exams dominate your thoughts. When you’re a practicing lawyer, this skill will prove invaluable… If you spend the money to lie on the beach in Maui, you don’t want your brain being held captive back in the office! Don’t compare study habits. Not everyone learns the same way. Some students will have detailed outlines by the third week of classes, some will organize study groups that meet three times a week, and there will be others who won’t write down a single note the entire semester. Don’t freak out because your study habits aren’t the same as the student sitting next to you in Torts class. You know how you learn best, so don’t try forcing your study habits to comport with someone else’s study patterns. You can’t remember all of it. You’re real smart. Up until now, it’s been pretty easy for you to remember most of the stuff you’ve learned in school. But now that you’re in law school, you’re freakin’ out a little bit because you can’t seem to remember the holding of every case you read. Don’t worry — it’s normal. You’re not going to be able to remember all of it — there’s just too much. It would be scarier if you were able to remember all of it… Remember how Johnny Mnemonic was able to remember all of that information by simply dumping a section of long term memory. Which portion? “My childhood.” 🙂 Besides, once you get out in the real world, you’ll forget 80% of this stuff anyway. That’s why we have all of those books on our shelves, so we can look it up when we forget. Yes, law school DOES prepare you for the real world. For law school exams, you’re forced to cram an incredible amount information into your head, hold onto it for a short period of time, digest it, regurgitate it persuasively on the exam, and then you promptly forget most of what you’ve learned. Sound useless? Not so. Trying cases, you’re forced to cram an incredible amount information into your head, hold onto it for a short period of time, digest it, regurgitate it persuasively to the jury, and then you promptly forget most of what you’ve learned. Focus on learning how to learn while you’re here. Want to be a Trial Lawyer? At Trial Theater, we want to provide you with all of the tools and ideas possible to help you triumph in the courtroom. In our weekly newsletter, we’ll give you tips, ideas, quotations, interviews, resources, and questions so that you can be your very best when you enter the courtroom. To start your free subscription, just fill in your information in the box up above.